Product #60701 | SKU OR-130 | 0.0 (no ratings yet) Thanks for your rating! The small Orca Lens/Accessory Bag is a compact solution for carrying your photo, video, and/or computer equipment. 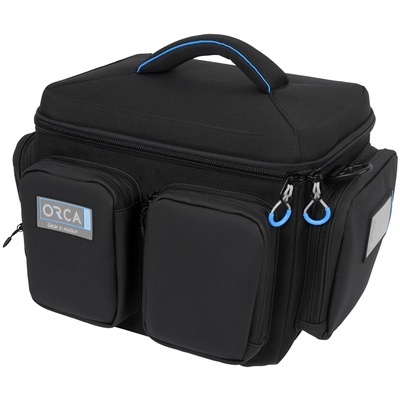 The Orca Lens/Accessory Bag (Small) is a compact solution for carrying your photo, video, and/or computer equipment. The large internal compartment features four removable padded dividers to protect your equipment, and four mesh pockets on the inside of the lid to hold smaller essentials. A built-in shelf that covers the main compartment also doubles as a laptop holder. A bungee-type cord built into the case can be used to secure your gear. For additional storage the case also has four zippered external pockets, with one featuring a clear ID window. The case can be carried either by the padded top handle or using the included padded shoulder strap.